Each AAF team will play 10 regular season games, followed by a four-team playoff that pairs the two highest-seeded teams from each division at the home site of the team with the better record. 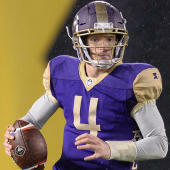 The AAF Championship Game will be held on April 27 in Las Vegas, as the two remaining teams battle to be the new league's first champion. Be sure to check back each week to see the updated standings below, including overall records, records at home and on the road, and division records.